Acta of Shoulder and Elbow Surgery | Volume 1 | Issue 1 | Oct-Dec 2016 | Page 35-43 | Adriano F Mendes Júnior, José da Mota Neto , Leandro F De Simoni, Carlos Alberto Menezes Mariosa, Bruno G. S. e Souza , Valdeci de Oliveira, Elmano de A Loures. Authors: Adriano F Mendes Júnior [1,2], José da Mota Neto [1,2,3], Leandro F De Simoni [1,3], Carlos Alberto Menezes Mariosa , Bruno G. S. e Souza [2,3], Valdeci de Oliveira [2,3], Elmano de A Loures . Shoulder and Elbow Surgery Group of Juiz de Fora. University Hospital, Federal University of Juiz de Fora. Therezinha de Jesus Maternity Hospital. Introduction: To present the correlation between the clinical and radiographic results of patients with a humeral shaft fracture treated with the MIPO technique. Method: A comparative retrospective study involving 31 patients with diaphyseal fractures of the humerus, from January 2014 to January 2016, with a minimum follow-up of six-months, surgically treated using the MIPO technique through an anterior approach. Outcomes were evaluated prospectively via clinical and radiographic exam, DASH, and SF-12. Results: mean follow-up of 19-months, with the majority of fractures classified as complex (n = 16; 51.6%) and a healing rate of 90.32%. Mean shoulder range of motion was 167°/57°/T6. In the elbow, mean flexion/extension was 125°/-5°. Non-consolidation occurred in three patients (9.7%), with two pseudoarthroses and one loss of reduction after osteosynthesis. Five patients presented primary radial apraxia, two without recovery from the injury. Secondary radial apraxia occurred in two patients, with full recovery. Patients who did not consolidate the fracture presented greater radiographic coronal deviation (d = 2.2), with the differences being statistically significant. Eight patients (25.8%) had an unsatisfactory DASH, with a longer elapsed time until surgery, less elevation of the shoulder, lower scores on the physical component of the SF-12, and higher pain scores, with statistically significant differences. Conclusion: MIPO demonstrated a 90.32% healing rate in the first six months post-operatively, with good clinical and functional results according to the DASH and SF-12 scores. Injuries by firearm combined with impairment of the radial nerve are related to a worse functional outcome in the sample evaluated. Evidence Level: III – comparative retrospective study. Keywords: Diaphyseal fracture of the humerus, osteosynthesis, MIPO, radial nerve paralysis. Diaphyseal fractures of the humerus represent 3 to 5% of the occurrence of all types of fractures,[11,30] with a bimodal age distribution: from 21 to 30 years – mainly due to high-energy trauma, and between 60 and 80 years, in cases of low-energy trauma [5,30]. Conservative treatment is indicated for the vast majority of these fractures, provided they are within the guidelines including: angular deviations less than 20 degrees, rotational less than 30 degrees, and less than 3 cm of shortening, in selected patients . However this can lead to unsatisfactory results associated with malunion of the fracture, pseudoarthrosis, and to weakening of the shoulder girdle [11,31,41]. Surgical treatment is indicated in patients with fractures with unacceptable deviations, polytrauma, with vascular and nerve injury, in obese patients, or in those with an orthostatic placement limitation, with the objective of surgical treatment thus being to avoid these complications and promote early rehabilitation . ORIF with plates and screws is still considered the gold standard of the surgical treatment options, despite the advent of biological techniques such as intramedullary nailing or “bridge plates”. Livani and Belangero presented the clinical results of the bridge plate method for surgical treatment of diaphyseal fractures of the humerus, and Apivatthakakul et al , detailed the anatomical landmarks of the technique and described the term MIPO (Minimally Invasive Plate Osteosynthesis). With the MIPO technique, patients experience early and active mobilization of the shoulder and elbow, due to good stability achieved and the minimal surgical aggression of the technique, in addition to the aesthetic benefit of two small incisions. Minimally invasive surgery has the potential to preserve the fracture hematoma, enhancing consolidation, [1,27] with the MIPO method for treatment of diaphyseal fractures of the humerus being considered reproducible, safe, and effective [14,18,20,22,37,38]. There are several characteristics fundamental for MIPO success, such as proper selection of the implant size, and the quantity and distribution of the screws . The use of long plates is recommended for this technique because the longer the plate, the more stable and effective it will be, provided that the system complies with the minimum number of screws on each fracture side. However, according to Tanaka, this orientation is empirical. The aim of this study is to evaluate, in a series of patients with humeral shaft fractures surgically treated using the MIPO technique, the clinical and radiographic results of treatment, as well as its impact on the upper limb function and quality of life of the patients. At the same time, we seek to identify the characteristics of fixation systems and their relationship to the consolidation outcome six months after surgery, and possible factors related to treatment failure using this technique. This is a retrospective study of patients with diaphyseal humeral fracture treated surgically using the MIPO technique in tertiary hospitals of our city, by three surgeons participating in the study, from January 2014 to January 2016. All patients operated on in this period were selected and invited to participate. The inclusion criteria were: over 18 years of age, surgery more than six months prior, and surgical treatment of humeral shaft fracture using the MIPO technique through an anterior approach. The exclusion criteria were: prior surgery on the same bone and inability to answer the functional assessment questionnaires or to appear for re-evaluation. This study was approved by the Research Ethics Committee of the institution, under opinion number CAAE 53181116.2.0000.5103. Patients who agreed to participate in the study signed a free and informed consent agreement. A total of 35 surgeries were performed that met the inclusion criteria during the period from January 2014 to January 2016. Four patients were excluded, three due to death and the other for refusing to participate in the study, totaling a sample of 31 patients, of whom 24 were male (77.4%) and seven female. The mean patient age was 35.3 ± 14.3 years, ranging from 20 to 78 years. We prospectively evaluated the clinical-functional results with a minimum follow-up of six-months, with clinical and radiographic exam data, with EVA, DASH functional assessment score, and the SF-12 quality of life questionnaire. The DASH results were divided into two groups: satisfactory and unsatisfactory, following the criteria of Chaitanya and Naveen. Medical records data were collected about neurological function before the surgery and after the procedure, the presence of signs of infection of the surgical site, status of the fracture consolidation at six months postoperative, and other associated clinical events. Fractures were classified according to the AO criteria and subsequently divided into simple (type A) and complex (type B and C), with postoperative radiographs being evaluated according to the following parameters: quality of reduction (angular deformity and distance between the main fragments), plate size used, number of screws on each side of the fixation, and working length area of the plate (distance between the screws closest to the fracture site) (Figure 1). Additionally, current radiographs of the humerus in coronal and sagittal views were obtained and were also evaluated regarding the status of consolidation, presence of loosening or failure of the implant, and residual deformity. The patient was placed supine and given general anesthesia associated with interscalene brachial plexus block, and antibiotic therapy was carried out with one gram of intravenous cefazolin after anesthesia. The surgical technique used was similar to the technique described by Livani and Belangero. Proximal access was gained, in an incision of approximately 3 to 5 cm, between the brachial tendon of the biceps muscle and the tendon of the deltoid muscle. Soon after, distal access was gained in an incision of about 3 to 5 cm between the biceps and the brachialis muscle. After visualization of the lateral cutaneous nerve of the forearm, the brachialis muscle was separated longitudinally. Narrow DCP plates were used, 4.5 mm (10 to 16 holes), which were inserted from proximal to distal, arm placed in the reduction position, one screw inserted distally and another proximally. At least two more screws, one proximal and another distal, were inserted for final fixation. After surgery, patients were encouraged to actively move the shoulder and the elbow, without load. Outpatient control was conducted at two and six weeks and at three and six months for functional and radiographic reevaluation looking for signs of consolidation. The primary outcome was the presence or absence of fracture healing at the time of reevaluation (minimum 6 months). 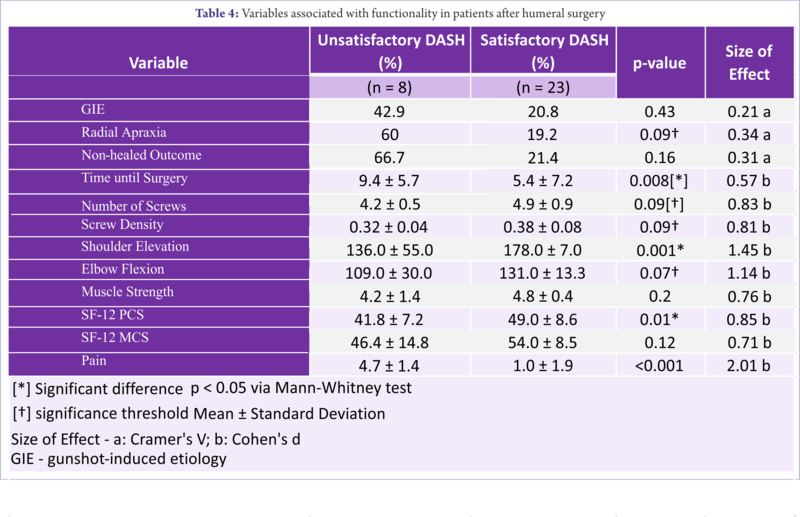 Secondary outcomes were the presence of complications, clinical-functional results via the DASH scale, the visual analog score (VAS) for pain, and the quality of life measured by the SF-12 questionnaire . Quantitative variables were described via mean and standard deviation, and qualitative variables via absolute frequency and percentages. Due to the sample size, we opted for the use of nonparametric tests. To test differences between groups in relation to the quantitative variables, we used the Mann-Whitney U test. The effect size was evaluated using Cohen’s d, using the weighted standard deviation, with the following classification for interpretation being adopted: 0.20 – 0:49: Small; 0.50 – 0.79: Medium; ≥ 0.80: Large. To test differences between proportions, Fisher’s exact test was used. In this case, the effect size was evaluated using Cramer’s V, with the following classification for interpretation being adopted: 0.10 – 0.29: Small; 0:30 – 0.49: Medium; ≥ 0.50: Large . All analyses were done with IBM SPSS V24 (IBM Corp., Armonk, NY) statistical software. The value of p <0.05 was adopted for statistical significance. For the variables where this study found a tendency of significance, using the G*Power 3.1 software, the sample size was calculated in order to find statistically significant relationships . Of the 31 participating patients, the mean follow-up time was 19.3 ± 6.1 months. All were right-handed (n = 29; 93.5%), except two. The fracture occurred in the left humerus, in 17 patients (54.8%), and the right humerus, in 14 patients (45.2%). The mean elapsed time until surgery was 6.4 ± 7.0 days, ranging from 0 to 32 days, with a median of five days. The most common cause of the fractures was a car or motorcycle accident (n = 14; 45.2%) and the other causes were: gunshot (n = 7; 22.6%), simple fall (n = 6; 19.4%), and fall from a height or direct trauma (n = 4; 12.8%). The fractures were classified as A in 15, B in 12, and C in 4 cases, grouped into simple (n = 15; 48.4%) and complex (n = 16; 51.6%). Fifteen (15) patients (48.4%) had associated lesions, such as: radial nerve apraxia (n=5; 16.1%), other fractures of the same segment (n = 2), and other lesions (n = 8). The mean range of motion (ROM) of the shoulder was 167° of elevation (± 32.88°), 57° (± 32.88°) of lateral rotation, and internal rotation with mean vertebral level T6 (only four patients had no internal rotation to the thoracic level). In the elbow, the mean ROM was 125° (± 21.05°) in flexion and -5° (± 12.36°) in extension. We found, in our sample, a 90.32% healing rate (28 patients) (Figure 2), with mean values of DASH = 19.2 (± 29.6), SF-12 PCS = 47.1 (±8.7), SF-12 MCS = 52.1 (± 10.7), and VAS = 2.0 (± 2.4) (Table 1). Non-consolidation of the fracture occurred in three patients (9.7%), with two pseudoarthroses and one loss of reduction after osteosynthesis, and all underwent ORIF with plates and screws. Eight patients (25.8%) had an unsatisfactory DASH, five patients (16.1%) had an unsatisfactory SF-12 PCS, and five patients (16.1%) had an unsatisfactory SF-12 MCS. Among the patients with primary radial nerve apraxia, two did not recover from the injury. Secondary radial nerve apraxia occurred in two patients, who achieved full recovery of function (mean 3.5 months). 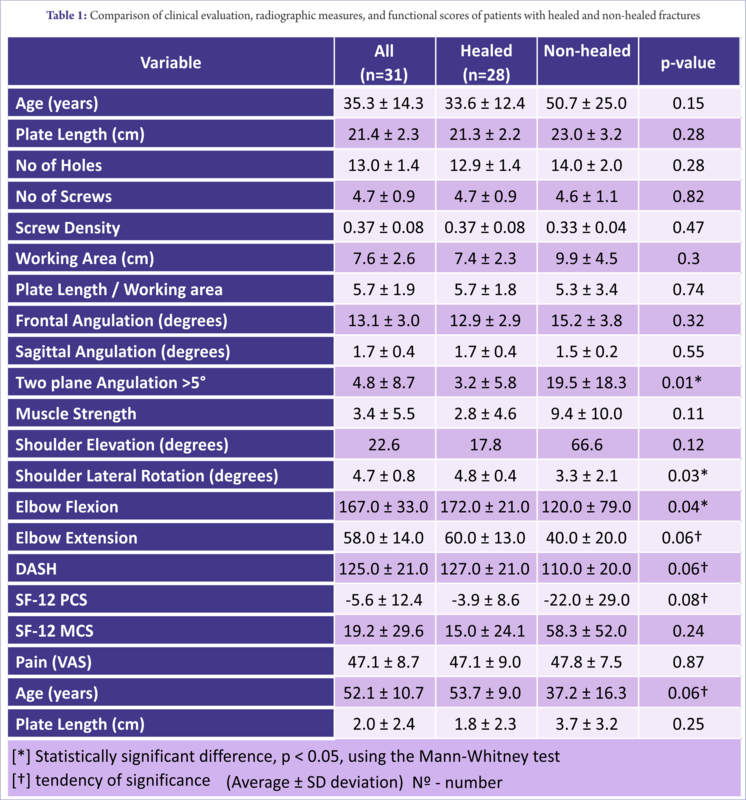 The comparison of plate characteristics, working length, and clinical-radiological and functional scores of the patients are presented in Tables 1 and 2. The patients who did not consolidate the fracture presented greater coronal deviation (d = 2.2), less muscle strength (d = 2.2), and lower shoulder elevation (d = 1.8), with the differences being statistically significant, and the observed size of effect being of high magnitude. Considering the variables with a moderate threshold of significance and size of effect, the data suggest that patients who failed to heal the fracture have a greater deviation > 5°, less shoulder rotation, less flexion and extension of the elbow, a higher percentage of unsatisfactory DASH, and a lower SF-12 MCS. For the other variables, no statistically significant differences nor important effect sizes were observed. Comparing the patients with gunshot-induced etiology (GIE) vs. other causes, it was observed that patients with a gunshot wound had a higher percentage of complex fractures (X2 = 8.477; p = 0.007; V = 0.52), a higher percentage of associated lesion (X2 = 5.044; p = 0.04; V = 0.40), a higher percentage of radial apraxia (X2 = 4.775; p = 0.06; V = 0.39), a higher percentage of deviation > 5° (X2 = 6.178; p = 0.03; V = 0.45), and a lower mean age (27.4 ± 8.4 vs. 37.6 ± 15.0 years, p = 0.05). After stratification of the patients with GIE and with radial apraxia, a higher percentage of these patients with an unsatisfactory DASH were observed when compared to other patients with an unsatisfactory DASH (100.0% vs. 17.9%, respectively) (Table 3). In addition, patients with GIE and radial apraxia presented less shoulder elevation (97.0 ± 76.0 vs. 175.0 ± 13.0; p = 0.02; d = 1.75) and greater pain (4.7 ± 2.3 vs. 1.7 ± 2.3; p = 0.04; d = 1.30) when compared with the other patients, respectively. From a practical point of view, the differences observed were of high magnitude. On the other hand, no association was observed between the SF-12 classification and the etiology of the lesion. Table 4 presents possible predictors of the disabilities assessed by the DASH in patients after surgery. It was observed that patients with an unsatisfactory DASH showed greater elapsed time until surgery, less elevation of the shoulder, lower scores on the physical component of the SF-12, and higher pain scores. The differences seen were statistically significant and the observed size of the effect was of high magnitude. Although they did not attain statistical significance, the presence of radial apraxia and the non-consolidation of the fracture presented a relation with the unsatisfactory DASH of moderate magnitude (Cramer’s V = 0.34 and 0.31, respectively). Furthermore, the data suggest that patients with an unsatisfactory DASH have a lower number and density of screws, less elbow flexion, less muscle strength, and a lower mental component of the SF-12. Although statistical significance was not observed, the effect size was high magnitude for these variables. For the variables where this study found a tendency of significance, and considering the 10% prevalence of non-union, 80% power, significance level of 5%, and a moderate size of the effect (Cramer’s V = 0.31 to 0.34) between the risk factor and the non-consolidation of the lesion, a sample size between 68 and 82 patients is estimated for statistically significant associations to be found. Humeral shaft fractures account for 5% of all fractures and the main treatment is still nonsurgical. Nevertheless, this method can result in unsatisfactory clinical outcomes, non-union, and limited range of motion. [9,25] Surgical treatment with MIPO uses the principle of relative stability, enhancing healing, and is a viable treatment option. We found involvement in 77.41% of men and a mean age of 35 years, with the fracture more common on the non-dominant side (54.83%), and that motor vehicle accidents (n = 10; 33.25%) and injuries by firearms (n = 7; 22.58%) were those mainly responsible for the fractures, similar to epidemiological data in the literature. [23,40,42] According to the AO classification, we found a higher incidence of type A (n = 15; 48.38%), followed by type B (n = 12; 37.50%), and C (n = 4; 12.90%), similar to the data in the literature [38, 40]. According to Tanaka , in the MIPO osteosynthesis, two factors are used to determine the length of the plate: the pattern of the fracture and the extent of the fracture line. The ratio of the plate length and the extent of the fracture line should be 2 or 3 in those with complex type and 8 to 10 in simple ones . In this study we adopted a standardization of the working length in the X-rays, similar to the length of the initial fracture line. We evaluated the relationship between the implant size and the working length and found the mean value of 1.7, with no statistically significant differences observed between the healed and unconsolidated groups (p = 0.55). As to the screw density, we found a mean of 0.37, which is in accordance with the values below 0.5 that are recommended, and observed no statistically significant differences between the healed and unconsolidated groups (p = 0.47). Large deviations of fragments can change the pattern of fracture healing, and the function. According to Perren, the elastic internal fixation is compatible with indirect fracture healing if there are no high levels of strain, which depends on the ratio between the length of the fracture zone and the displacement of the fragments. According to the same theory, strain values above 10% induce bone resorption from the fracture site, inhibiting consolidation. According to Shields, residual angular deformity of up to 18 degrees in the sagittal plane and up to 27 degrees in the coronal plane had no statistical correlation with DASH or patient satisfaction level. In patients where there was no consolidation, we observed major deviations in the anteroposterior radiograph (d = 2.2), with statistically significant differences, and the observed size of the effect was of high magnitude. The most common complication of diaphyseal fractures of the humerus is radial nerve palsy, occurring in 2 to 17% of the cases 24, and according to Samardizc et al  it can be divided into two types: primary, upon diagnosis of the fracture, and secondary, which arises after surgery. The management of primary apraxia associated with fractures with surgical indication is controversial. According to Liu et al , the recovery of the radial nerve function in an acute fracture of the humeral shaft does not depend upon the initial approach. Pailhé et al  state that the primary moment of fixation is ideal for exploring the radial nerve path in search of contusions or entrapments. Shao et al  does not advise early exploration due to the high rate of spontaneous recovery, indicating it only after 3 months and with signs of fracture healing. Pailhé et al  states that the open approach with reduction and fixation with plate and screws in fractures with primary apraxia provided recovery of function in 75% of the cases, in a period of three days. Livani and Belangero  used the MIPO technique combined with primary exploration of the nerve path and reported consolidation of all fractures in 3 months, with nerve paralysis recovery in all patients. We note that the five patients with primary apraxia underwent MIPO without primary exploration of the radial nerve, with bone healing in four cases and recovery of function in three. The choice of the MIPO technique without primary exploration of the nerve was also described by Kim et al , who reported 36 patients treated with the MIPO technique, with four presenting primary neurapraxia, and that recovery of function occurred in all of them. In open fractures with radial nerve paralysis, Pidhorz  states that the exploration should be performed if the fracture requires surgical correction. According to Carrol et al , there is an indication for exploration of the radial nerve in cases of fractures caused by firearm projectiles or penetrating wounds. However, Dougherty et al  states that surgical stabilization of the fracture depends on the surgical team, the degree of bone injury, and the resources available at the time of treatment. According to Bumbasirevi et al , 94% of his patients with fractures had recovery of their case, with low rates of pseudoarthrosis, leading the author to recommend no initial exploration. 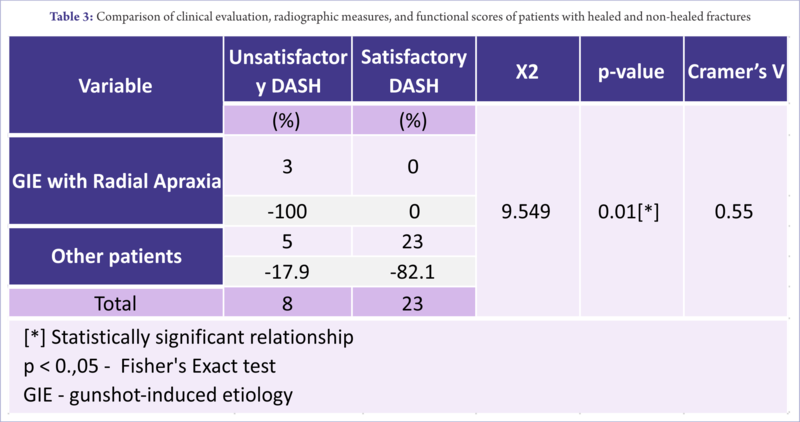 We found that patients with GIE and radial apraxia had a higher percentage of unsatisfactory DASH compared to other patients. Moreover, they had lower elevation of the shoulder and greater pain complaints. We set a standard, from these results, that in cases of displaced fractures of the humeral shaft from GIE and with clinical radial nerve injury, the fracture is to be stabilized using the MIPO technique, with exploration of the radial nerve. Overall evaluation of patients with functional and quality of life scores is important for measuring results of surgical treatment in trauma. Chaitanya 9 validated the use of the DASH in patients with humeral shaft fractures. Kiely et al  showed that the SF-12 can be used to assess quality of life in trauma victim patients, however, the mental component (MCS) proved to be minimally responsive to changes. Our results suggest that patients who do not consolidate present a higher percentage of unsatisfactory DASH, and a lower-SF-12 MCS. Shields et al  affirmed that among the independent variables predictive of DASH and SF-12, in patients with a humeral shaft fracture, increasing age influenced the result. This was not corroborated in our study, since we observed that patients with an unsatisfactory DASH presented lower scores on the physical component of the SF-12, and higher pain scores, with statistically significant differences. As limitations of the study we note the retrospective nature, loss of some data such as initial radiographs of some patients, preventing the assessment of the similarity between the ratio of plate size and length of the fracture. We had the loss of follow-up of some patients which, coupled with the small size of our sample, limited some conclusions. The treatment of diaphyseal fractures of the humerus with an anterior MIPO demonstrated a 90.32% healing rate in the first six months post-operatively, with good clinical and functional results according to the DASH and SF-12 scores. Patients who did not heal the fracture presented greater radiographic coronal deviation. Patients with an unsatisfactory DASH had a longer elapsed time until surgery, less elevation of the shoulder, lower scores on the physical component of the SF-12, and higher pain scores, with statistically significant differences. Injuries by firearm combined with impairment of the radial nerve are related to a worse functional outcome in the sample evaluated. 1. An Z, Zeng B, He X, Chen Q, Hu S. Plating osteosynthesis of mid-distal humeral shaft fractures: minimally invasive versus conventional open reduction technique. Int Orthop. 2010 Feb;34(1):131-5. 2. Apivatthakakul T, Arpornchayanon O, Bavornratanavech S. Minimally invasive plate osteosynthesis (MIPO) of the humeral shaft fracture. Is it possible? A cadaveric study and preliminary report. Injury. 2005 Apr;36(4):530-8. 3. Barbieri CH, Mazeer N, Barros MM. Fraturas diafisárias do úmero. Rev Bras Ortop. 1996; 31(7):587-94. 4. Benegas E, Ferreira Neto AA, Bolliger Neto R, Prada FS, Malavolta EA, Marchitto GO. Fraturas da diáfise do úmero. Rev Bras Ortop. 2010;45(1):12-16. 5. Bhandari M, Devereaux PJ, McKee MD, Schemitsch EH. Compression plating versus intramedullary nailing of humeral shaft fractures–a meta-analysis. Acta Orthop. 2006 Apr;77(2):279-84. 6. Bumbasirević M, Lesić A, Bumbasirević V, Cobeljić G, Milosević I, Atkinson HD. The management of humeral shaft fractures with associated radial nerve palsy: a review of 117 cases. Arch Orthop Trauma Surg. 2010 Apr;130(4):519-22. 7. Camelier AA. Avaliação da qualidade de vida relacionada à sáude em pacientes com DPOC: estudo de base populacional com o SF – 12 na cidade de São Paulo [tese]. São Paulo: Universidade Federal do Estado de São Paulo; 2004. 8. Carroll EA, Schweppe M, Langfitt M, Miller AN, Halvorson JJ. Management of humeral shaft fractures. J Am Acad Orthop Surg. 2012 Jul;20(7):423-33. 9. Chaitanya PR, Naveen PR. 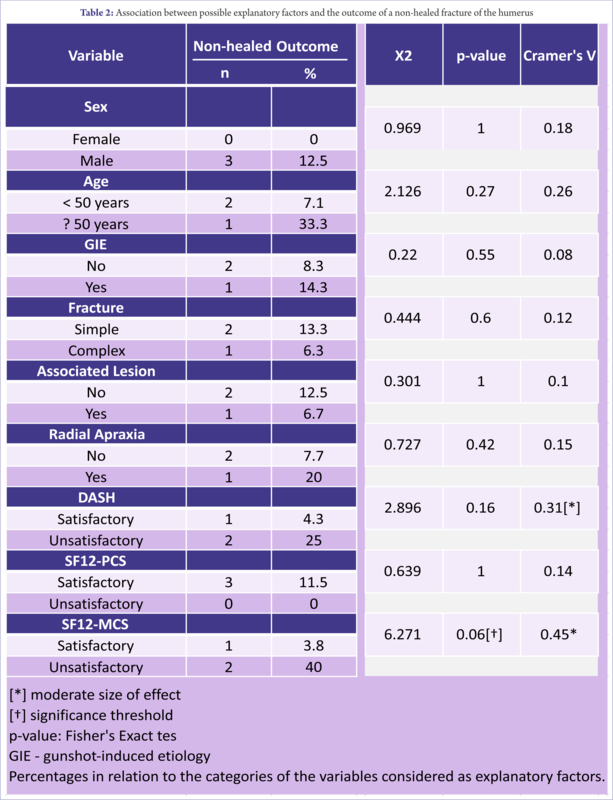 Clinico-radiological validation of the DASH questionnaire in patients operated for fracture of shaft of humerus. Int J Res Med Sci. 2015 Jan;3(1):287-90 DOI:10.5455/2320-6012.ijrms20150152. 10. Cohen J. A power primer. Psychol Bull. 1992 Jul;112(1):155-9. 11. Denard A Jr, Richards JE, Obremskey WT, Tucker MC, Floyd M, Herzog GA. Outcome of nonoperative vs operative treatment of humeral shaft fractures: a retrospective study of 213 patients. Orthopedics. 2010 Aug;33(8). DOI:10.3928/01477447-20100625-16. 12. Dougherty PJ, Najibi S, Morandi M. Gunshot humerus shaft fractures. Tech Orthop. 2006;21(3):214-7. 13. Faul F, Erdfelder E, Lang AG, Buchner A. G*Power 3: a flexible statistical power analysis program for the social, behavioral, and biomedical sciences. Behav Res Methods. 2007 May;39(2):175-91. 14. Jiang R, Luo CF, Zeng BF, Mei GH. Minimally invasive plating for complex humeral shaft fractures. Arch Orthop Trauma Surg. 2007 Sep;127(7):531-5. DOI 10.1007/s00402-007-0313-z. 15. Kellam JF, Audigé A. Classificação de fraturas. In: Rüedi TP, Buckley RE, Moran CG. Princípios AO do tratamento de fraturas. 2a. ed. Porto Alegre: Artmed, 2009. p. 93-109. 16. Kiely JM, Brasel KJ, Guse CE, Weigelt JA. Correlation of SF-12 and SF-36 in a trauma population. J Surg Res. 2006 May 15;132(2):214-8. 17. Kim JW, Oh CW, Byun YS, Kim JJ, Park KC. A prospective randomized study of operative treatment for noncomminuted humeral shaft fractures: conventional open plating versus minimal invasive plate osteosynthesis. J Orthop Trauma. 2015 Apr;29(4):189-94. 18. Kobayashi M, Watanabe Y, Matsushita T. Early full range of shoulder and elbow motion is possible after minimally invasive plate osteosynthesis for humeral shaft fractures. J Orthop Trauma. 2010 Apr;24(4):212-6. 19. Liu GY, Zhang CY, Wu HW. Comparison of initial nonoperative and operative management of radial nerve palsy associated with acute humeral shaft fractures. Orthopedics. 2012 Aug 1;35(8):702-8. 20. Livani B, Belangero WD. Bridging plate osteosynthesis of humeral shaft fractures. Injury. 2004 Jun;35(6):587-95. 21. Livani B, Belangero WD, Medeiros RC. Fractures of the distal third of the humerus with palsy of the radial nerve: management using minimally-invasive percutaneous plate osteosynthesis. J Bone Joint Surg Br. 2006 Dec;88(12):1625-8. 22. López-Arévalo R, de Llano-Temboury AQ, Serrano-Montilla J, de Llano-Giménez EQ, Fernández-Medina JM. 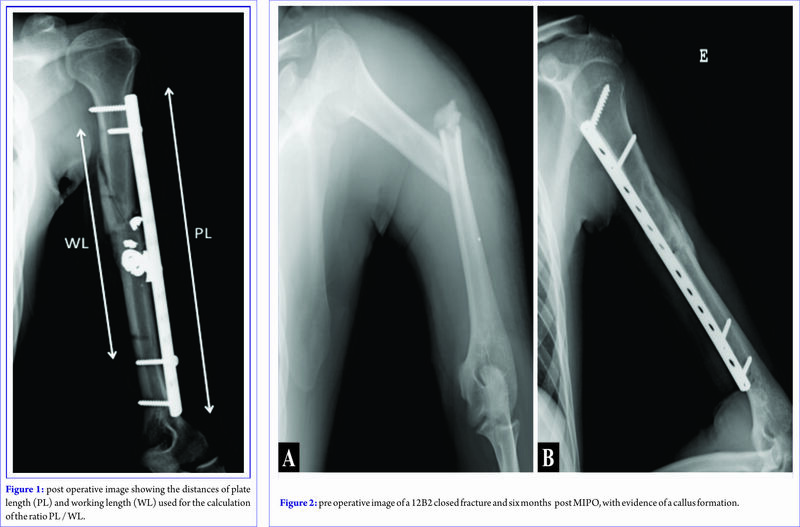 Treatment of diaphyseal humeral fractures with the minimally invasive percutaneous plate (MIPPO) technique: a cadaveric study and clinical results. J Orthop Trauma. 2011 May;25(5):294-9. 23. Malhan S, Thomas S, Srivastav S, Agarwal S, Mittal V, Nadkarni B, et al. Minimally invasive plate osteosynthesis using a locking compression plate for diaphyseal humeral fractures. J Orthop Surg (Hong Kong). 2012 Dec;20(3):292-6. 24. Martins J, Napoles BV, Hoffman CB, Oliveira AS. Versão brasileira do Shoulder Pain and Disability Index: tradução, adaptação cultural e confiabilidade. Rev Bras Fisioter. 2010 nov./dez.;14(6):527-36. 25. Matsunaga FT, Tamaoki MJ, Matsumoto MH, dos Santos JB, Faloppa F, Belloti JC. Treatment of the humeral shaft fractures–minimally invasive osteosynthesis with bridge plate versus conservative treatment with functional brace: study protocol for a randomised controlled trial. Trials. 2013 Aug;14:246. 26. McKee MD. Fraturas da diáfise do úmero. In: Bucholz RW, Heckman JD, Court-Brown CM, editors. Rockwood e green’s: fraturas em adultos. 7a. ed. Barueri: Manole, 2013 p. 1000-38. 27. Oh CW, Byun YS, Oh JK, Kim JJ, Jeon IH, Lee JH, et al. Plating of humeral shaft fractures: comparison of standard conventional plating versus minimally invasive plating. Orthop Traumatol Surg Res. 2012 Feb;98(1):54-60. 28. Pailhé R, Mesquida V, Rubens-Duval B, Saragaglia D. Plate osteosynthesis of humeral diaphyseal fractures associated with radial palsy: twenty cases. Int Orthop. 2015 Aug;39(8):1653-7. 29. Perren SM. Evolution of the internal fixation of long bone fractures. The scientific basis of biological internal fixation: choosing a new balance between stability and biology. J Bone Joint Surg Br. 2002 Nov;84(8):1093-110. 30. Pidhorz L. Acute and chronic humeral shaft fractures in adults. Orthop Traumatol Surg Res. 2015 Feb;101(1 Suppl):S41-9. 31. Rosenberg N, Soudry M. Shoulder impairment following treatment of diaphysial fractures of humerus by functional brace. Arch Orthop Trauma Surg. 2006 Sep;126(7):437-40. 32. Rubbo AB. Avaliação de dor pós-operatória em cirurgia bariátrica [tese]. São Paulo: Faculdade de Ciências Médicas da Santa Casa de São Paulo; 2010. 33. Samardzić M, Grujicić D, Milinković ZB. Radial nerve lesions associated with fractures of the humeral shaft. Injury. 1990 Jul;21(4):220-2. 34. Shao YC, Harwood P, Grotz MR, Limb D, Giannoudis PV. Radial nerve palsy associated with fractures of the shaft of the humerus: a systematic review. J Bone Joint Surg Br. 2005 Dec;87(12):1647-52. 35. Shields E, Sundem L, Childs S, Maceroli M, Humphrey C, Ketz J, et al. Factors predicting patient-reported functional outcome scores after humeral shaft fractures. Injury. 2015 Apr;46(4):693-8. 36. Shields E, Sundem L, Childs S, Maceroli M, Humphrey C, Ketz JP, et al. The impact of residual angulation on patient reported functional outcome scores after non-operative treatment for humeral shaft fractures. Injury. 2016 Apr;47(4):914-8. 37. Shin SJ, Sohn HS, Do NH. Minimally invasive plate osteosynthesis of humeral shaft fractures: a technique to aid fracture reduction and minimize complications. J Orthop Trauma. 2012 Oct;26(10):585-9. 38. Superti MJ, Martynetz F, Falavinha RS, Fávaro RC, Villas Boas LF, Mussi Filho S, et al. Avaliação dos pacientes submetidos à fixação de fraturas diafisárias do úmero pela técnica minimamente invasiva – Placa-ponte. Rev Bras Ortop. 2012;47(3):310-7. 39. Tanaka T. Tomada de decisão e planejamento pré-operatório. In: On Tong G, Bavonratanavech S. Manual de tratamento de fraturas da AO: osteossíntese com Placa Minimamente Invasiva (MIPO). Porto Alegre: Artmed; 2009. p. 95-107. 40. Tytherleigh-Strong G, Walls N, McQueen MM. The epidemiology of humeral shaft fractures. J Bone Joint Surg Br. 1998 Mar;80(2):249-53. 41. Westrick E, Hamilton B, Toogood P, Henley B, Firoozabadi R. Humeral shaft fractures: results of operative and non-operative treatment. Int Orthop. 2016 May. 42. Zogaib RK, Morgan S, Belangero PS, Fernandes HJA, Belangero WD, Livani B. Minimal invasive ostheosintesis for treatment of diaphiseal transverse humeral shaft fractures. Acta ortop. bras. 2014;22(2):94-8.